A regular girl, Veronica (Carrie Hope Fletcher), tries to survive the social jungle of high school by sticking with the three most popular girls at school who are all called Heathers. As she meets a sociopath named JD (Jamie Muscato), her life will change forever in a spiral of hate. Heathers the Musical, adapted from the 1988 cult film, Heathers, starring Winona Ryder and Christian Slater, is set in an American high school in the 80s. 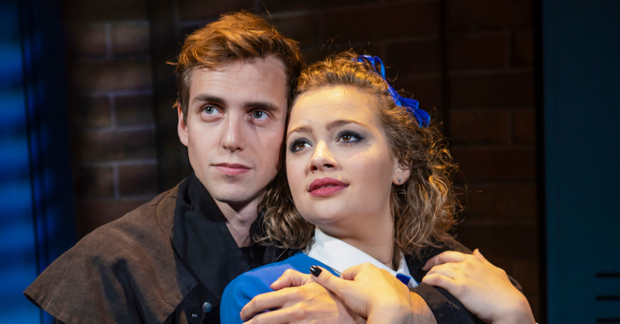 It transfers to the West End after a sold out run at The Other Palace, and it is produced by Bill Kenwright and Paul Taylor-Mills, with direction from Andy Fickman and beautiful choreography by Gary Lloyd. There are many stereotypes in the plot: the macho football jocks; the fat girl; the elite girls; the self-indulgent teachers; the mysterious lone wolf; apathetic parents. All these characters contribute in creating an absurd high school where the surreal events take place. The dark story becomes weird – what is fun about teenager killing each other and getting away with it? - and I really struggled to understand the clumsy script, Veronica’s choices and where the whole story was going. The cast is very talented. Carrie Hope Fletcher is a brilliant Veronica and she sings beautifully. The three Heathers (Jodie Steele, T’Shan Williams and Sophie Isaacs) have a very good stage presence. Dominic Andersen and Chris Chung's as the macho quarterbacks Kurt and Ram are very good in providing comic relief. Jamie Muscato is the real surprise of the show. His vocals are amazing, and he adds the right dose of charm and darkness into his character. Heathers is an entertaining and energetic musical with a wacky story that will be loved by teenage audiences.